Fancy Napkin: .diy: crib sheet tutorial. Remember my impossibly long 'baby to-do list' that everyone figured would make me want to pull all my hair out? Well, things are progressing nicely on it and with the husband's help, I have managed to check a few more items off the list [yeah me!]. Most importantly, and what I want to show you today, is what I worked on this weekend. 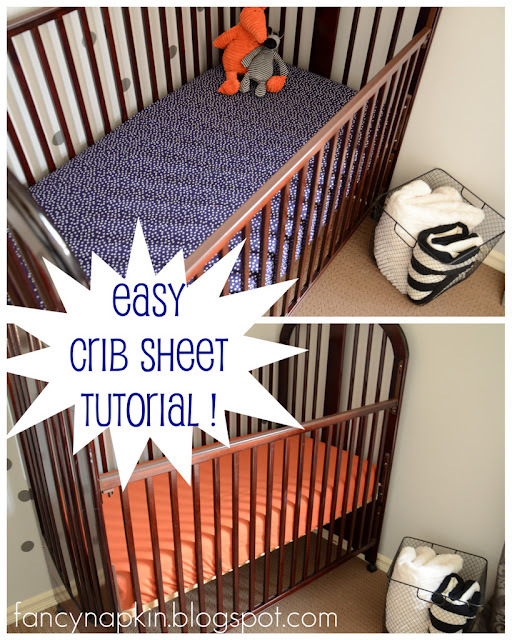 I am first going to admit that I have spent way too much time searching all over the mighty internet for modern crib sheets, with very limited luck. 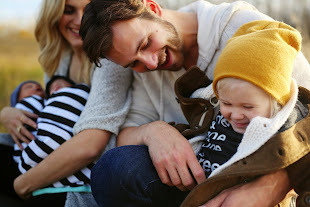 And although yes, there are certainly a lot of options if you look hard enough, most of the cute ones [and all the ones i gravitate too] come with a hefty price tag. Ouch. So after realizing that I can probably just make them myself, I busted out my old sewing machine [a gift from my sweet father that is not used nearly enough] and attempted to create my little babe's new sheets. With the help of a mis-mash of tutorials, via youtube & pinterest, here's how this beginner sewer [moi!] made her very own crib sheets. I hope you give it a try.....you might just surprise yourself. I know I did! [step one] Collect your supplies. Note: Make sure you pre-wash your fabric before cutting. It may shrink a little and I'd be so upset if you did all the work, just for it not to fit once washed! [step two] Cut your fabric into a rectangle that's 45 x 67 inches [114.5 x 171 cm]. [step three] Cut an 8 x 8 inch [20.5 x 20.5 cm] square out of each corner. [step four] Pull the two sides of one corner together, with the good side of the pattern on the inside. 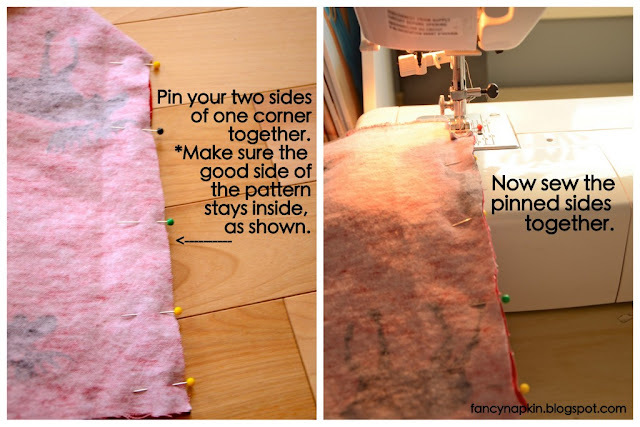 Pin together to make a 'pocket'. Do this for each of the four corners. Then sew each pinned side together. 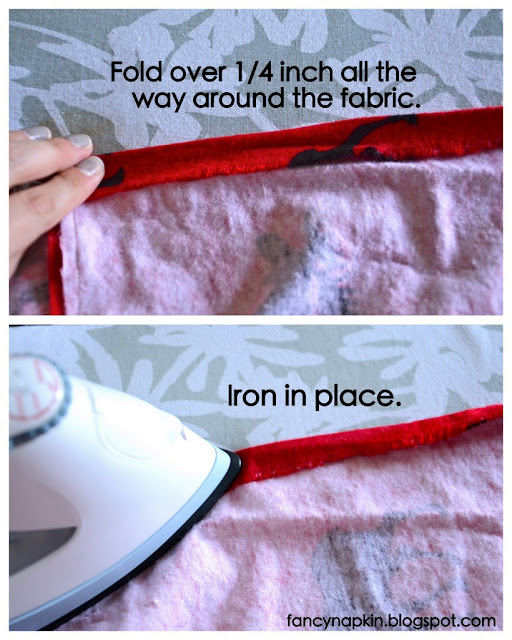 [step five] Now iron the edge of your fabric over 1/4 inch going all the way around. This is creating a casing which you will string your elastic through. [step six] Sew down the casing, going the entire way around your fabric. Note: Make sure you put a pin at the start and stop point so that you leave an opening to get the elastic in and out. 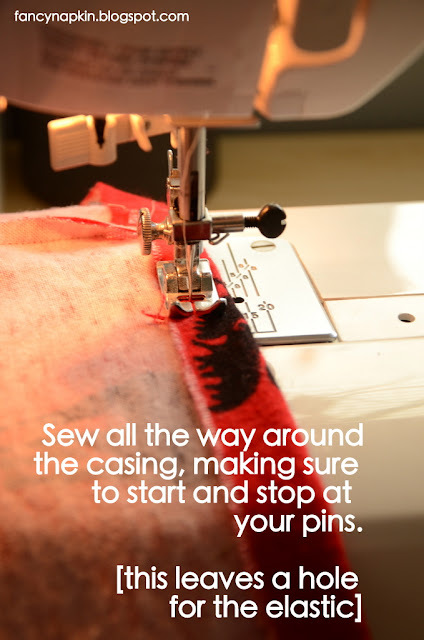 Start sewing at the start point, and stop sewing at the stop point. Easy enough, right? 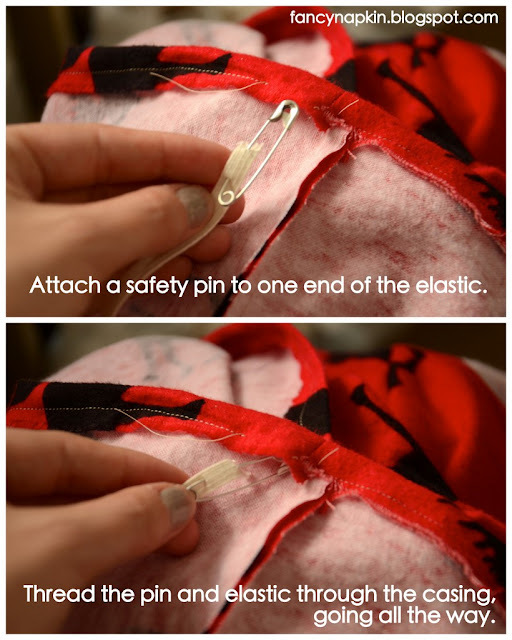 [step seven] Attach a safety pin [just large enough that it'll fit in between your casing] on one end of your 1/4 inch wide elastic and pin down the other end to your sheet [this is so that it doesn't get pulled all the way through]. Start stringing the elastic through the casing, all the way till it reaches the other side. [step eight] Sew the two ends of the elastic together, using a zigzag stitch to secure it snugly. Then sew up the open hole of the casing for a clean finish. And your DONE! Next up? A crib skirt, which is very needed to hide all that extra storage under the crib and hide that wood bar. And maybe some burp cloths with all the extra fabric pieces? It's such a labor of love that nursery....as with all nurseries I'm sure. And I have some matching pj's to go with that fabric! hahaha, I can't get enough of those moose's! Wow, I'm impressed! I've been meaning to buy a sewing machine and just never get around to it. Awesome tutorial, love all of the little tips that I wouldn't have thought of (like pinning the elastic so the end isn't pulled through). Trust me, it was trial and error the whole way! Those tips I could have used before starting, so I'd figure I'd share. Great job Erinn!! Your momma is soooo impressed!!! Thanks momma :) Perhaps a chip off the old block, hey? This is something I really wish I would have done when my kids were born. I just used plain white flannel sheets from walmart, which worked, but the room would have been so much cuter with custom-made ones! I'm filing away your tutorial just in case I need it one day! Thanks so much for visiting my blog and commenting! I plan to read more of your blog as soon as I finish this comment! how much elastic do you need for one sheet? All the measurements are in the 3rd picture at the top, however you will need 80" of 1/4" skinny elastic. Such a good idea! I'm a newbie to sewing (as in I've only attempted/completed one project) and I really want to try this out! Especially since I have a little man on the way :) maybe I'll try to do his whole bedding set myself... definitely cheaper than buying one! Definitely cheaper! I'm no sewer either, but had no problem making these and know you'll do a great job! Good luck! Hope it works out! Thank you for this tutorial! Just followed it and it worked perfectly! Amazing tutorial very easy to follow. I just finished making a starwars sheet for my nursery and it fits perfect :) thank you so much!! That sounds awesome! And you are so welcome! Does this fit just a standard sized crib mattress?